So you like circles? You're in luck! We LOVE circles and with these NEW circles, tips, tricks and inspiration you are sure to create something uh-mazing (that by the way, we would love for you to share with us #beaducation). We know what you are thinking...and YES, you may buy these in bulk at a discount. Now...for some inspiration & tutorials!!!! 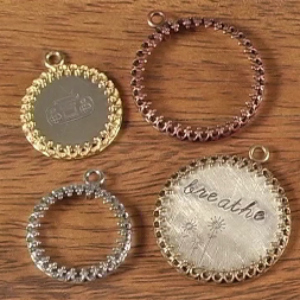 These necklaces were created specifically for our circle sample packs . We wanted a DIY project that demonstrated the sizes of our blanks AND fonts in a clear way. The golden brass necklace includes every circle blank that is included in the brass circle sample pack, and it is stamped with the 2mm lowercase Kismet letter set. 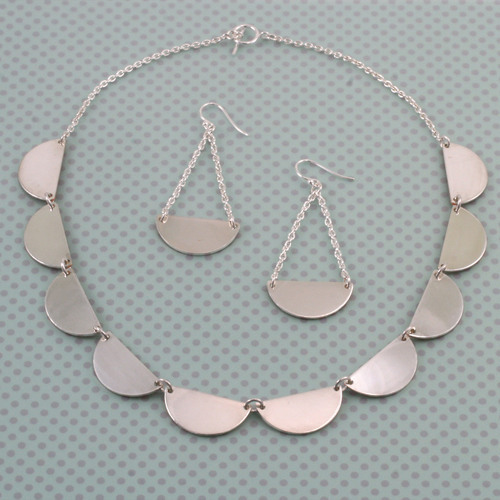 The two silver tone necklaces are made with every blank that is included in the nickel circle sample pack, just split in two. 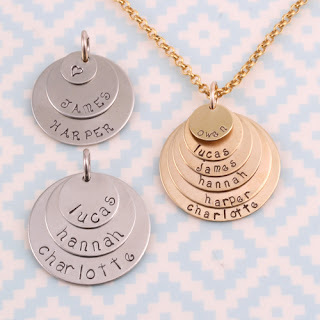 You can see how the various blanks work with different font sizes when you compare the necklaces, because the same names are stamped on the same size blanks. Find all the details and everything you need to make these stamped metal circle necklaces here. This ring is easy, peasy with the help of the nylon jaw ring pliers to round it out! Stamp a fun design on a circle blank and then shape it to match our rivetable ring and, voila! This ring is stunning AND comfortable. Keep in mind the rivetable rings come in sterling and plated, so if you want to match the metal color with the blank on top, use sterling or nickel silver with the sterling ring, or brass with the plated (so it will match the core of the rivet). We used copper with a plated ring so the brass looks like a design feature. 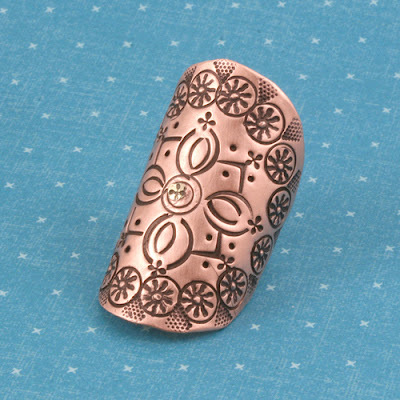 Find all the details and everything you need to make this riveted and metal stamped ring here. Do you like a simple look with a bit of variation? We love how this necklace can be silver OR copper by just flipping it one way or the other. This scalloped necklace is easy to make as you just have to cut our 1" single clad circle blank in half, and BAM, you now have two blanks for the price of one! It only takes 5 circle blanks to make this necklace and only 1 to create the earrings. 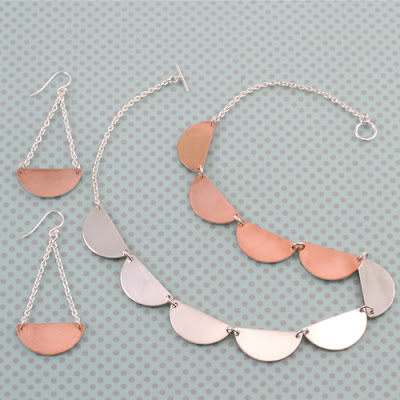 Single clad lets you wear copper when you are feeling a warmer look and silver when you crave something cool. Find details and everything you to make this metal scalloped necklace need here. 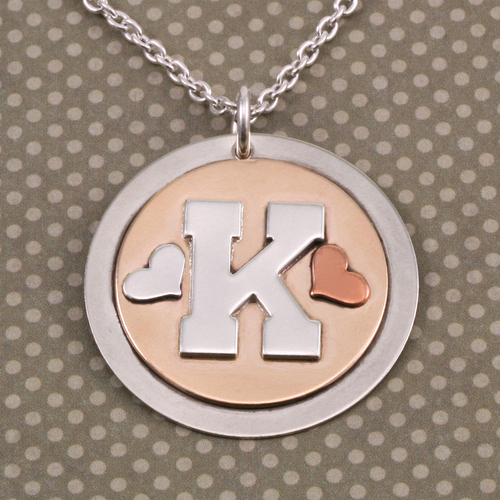 This soldered pendant is a perfect way to show some love. We took the Alphabet Letter K and cut off the top loop to solder it neatly to a circle blank. Then we added in a few solderable accents -- our tiny copper hearts and silver hearts. Our Introduction to Soldering Class is a great place to start! 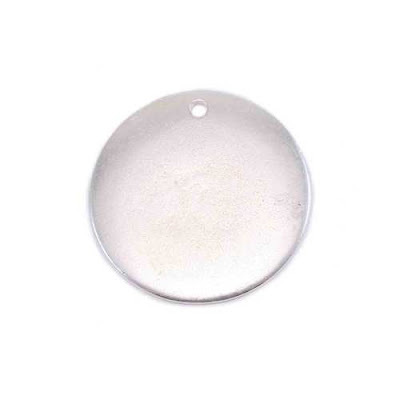 Find details and everything you need to make this soldered pendant circle necklace here. If you love both owls and circles, you must see our adorable Owl Circle Necklaces made with Beaducation Original metal stamp designs.